T-I-R-I-N-G. No. You were not. You were tirED. The thing is, the students aren’t the only ones to get this wrong. I have had teachers admit that the whole -ing or -ed vocabulary is confusing and just plain weird. 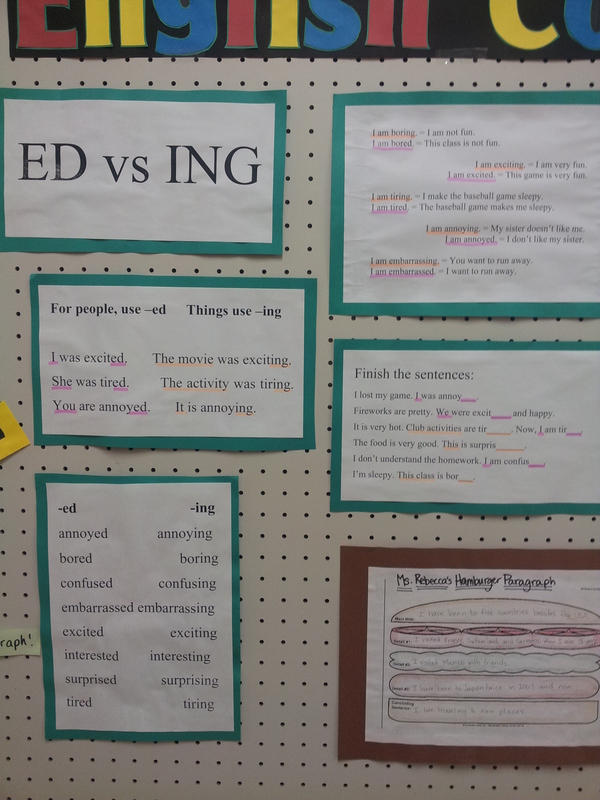 In response to this, I tried to think of what is wrong with how the students are using these different words, and made a bulletin board. Hopefully the students find this board as useful as the teachers do! Yes, this will also be in the dropbox under English Boards. There was really one main rule. People use -ed, and things use -ing. Wait, wait, wait. Don’t start yelling at me. I know that’s not the actual rule. I know. I speak English. Sometimes. But it’s a good first rule for our students. Baseball is never tirED. Baseball is a thing. And really, you aren’t tirING… I hope. The thing is, think about what your students are going to be trying to say. MOST of the time, they want to use the adjective with the -ed ending for themselves or their friends. In this board, I also included a list of potential words the students use and practice sentences. Recently, I added an equation portion. For example, “I am boring. = I am not fun.” and “I am bored. = This class is not fun.” When I have used these equation sentences with students, it seems to help them understand the difference between using -ed and -ing words. Hopefully you’ll be able to help your students too!